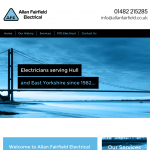 We offer a whole range of electrical services for any project large or small. Take a look at what we can offer below, and if there’s something you need more information about please don’t hesitate to get in touch. © 2015 Allan Fairfield Electrical Ltd. All Rights Reserved.